Director: Frederick Wiseman. 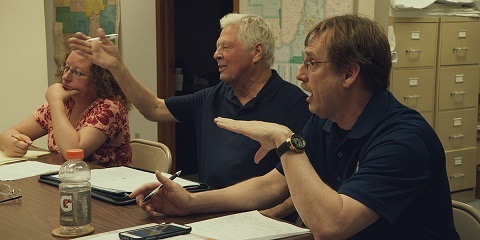 Documentary about the local culture, institutions, and governance of a small Midwestern town. Twitter Capsule: Wiseman's gaze always engrosses but his best films reframe your perceptions of the subject. This doesn't, quite. Second Capsule: As an urban voter often told I have no grasp of "small town America," little here suggested that. Not a knock; perhaps a point of interest. Third Capsule: The choice not to enter a single Monrovian home is consistent with Wiseman's defining interest in public institutions but also a little odd. VOR: ③ Is a non-editorializing, concertedly apolitical, 2½-hour record of a nearly all-white, Trump-supporting town a valuable document or a galling dodge?